The main warehouse, alongside the Island Store, has been re-roofed. 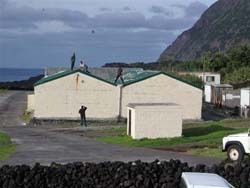 This photograph received on 8th May 2006 shows the main warehouse, alongside the Island Store, being re-roofed. The Tristan workforce is often engaged in repairs to roofs, which are liable to regular storm damage. Since the 2001 Hurricane, nearly all The Settlement's buildings have been re-roofed with zinc-coated steel in various colours. Most families hire a walk-in freezer in this complex as well as having home freezers and fridges.